​Media Coverage: MIT News, Nature News, BBC, Forbes, NBC News, National Geographic, Marshable, Quartz, Tech Xplore etc. Yoonho Kim, Hyunwoo Yuk, Ruike Zhao, Shawn A. Chester, Xuanhe Zhao, “Untethered Soft Machines and Robots by Printing Ferromagnetic Soft Materials ,” ASME IMECE 2018, Pittsburgh, Pennsylvania, USA, Nov. 2018. Yoonho Kim, Hyunwoo Yuk, Ruike Zhao, Shawn A. Chester, Xuanhe Zhao, “Printing Ferromagnetic Domains for Untethered Fast-transforming Soft Materials,” 2018 MRS Spring, Phoenix, Arizona, USA, Apr. 2018. 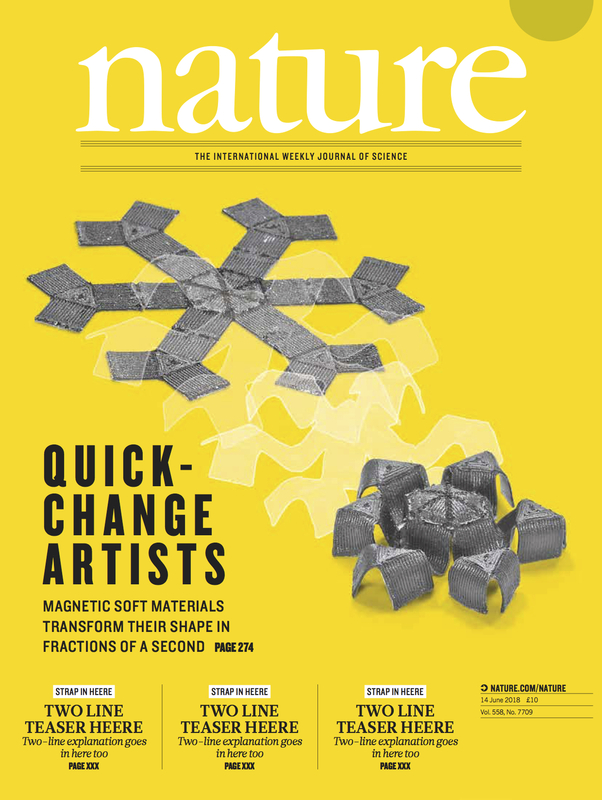 Yoonho Kim, Hyunwoo Yuk, Ruike Zhao, Shawn A. Chester, Xuanhe Zhao, “Ferromagnetic 4D Printing of Programmable Soft Active Matter,” 2017 MRS Fall, Boston, Massachusetts, USA, Nov. 2017. Sun. G. Chung, Yoon-Ho Kim, Seongjun Park, and Sung-In Kim, “Effects of Cervical Extension on the Deformation of Intervertebral Disc and the Migration of Nucleus Pulposus,” PM&R, vol. 5, no. 9, pp. S134–S134, 2013. Yoon-Ho Kim, Yong-Jai Park, and Kyu-Jin Cho, “Kinematic and Force Analysis of Tendon-gear Transmission System for Minimally Invasive Surgical Instrument,” 45th Spring Conference of the Korean Society of Medical and Biological Engineering (KOSOMBE), 2012. Yoon-Ho Kim, Yong-Jai. Park, Chang Wook Jeong, and Kyu-Jin Cho, “Torque Transmissibility Analysis of Tendon-gear Mechanism for Development of Mechatronic Instrument for Laparoscopic Surgery,” 5th Annual Conference of Korean Society of Medical Robotics (KSMR), 2013. Yoonho Kim, Hyunwoo Yuk, Xuanhe Zhao, “Programmable Soft Materials Containing Ferromagnetic Domains and Methods of Making,”, US Patent Application submitted (2018). Yoon-Ho Kim, Sung-In Kim, Seongjun Park, Chiyul Yoon, Sung-Hoon Ahn, Sun. G. Chung, “Pillow for Patients with Cervical Disc Herniation,” Republic of Korea Patent, 1014439710000, 2014. Yoon-Ho Kim, Jongchan Baek, Sungmin Nam, Sang Uk Lee, Seungsoo Lee, Jaehyun Ko, Kiryang A. Lee, Daniel Rhim, Kyu-Jin Cho, “Detachable Wheelchair Umbrella,” Republic of Korea Patent, 1014274000000, 2014. 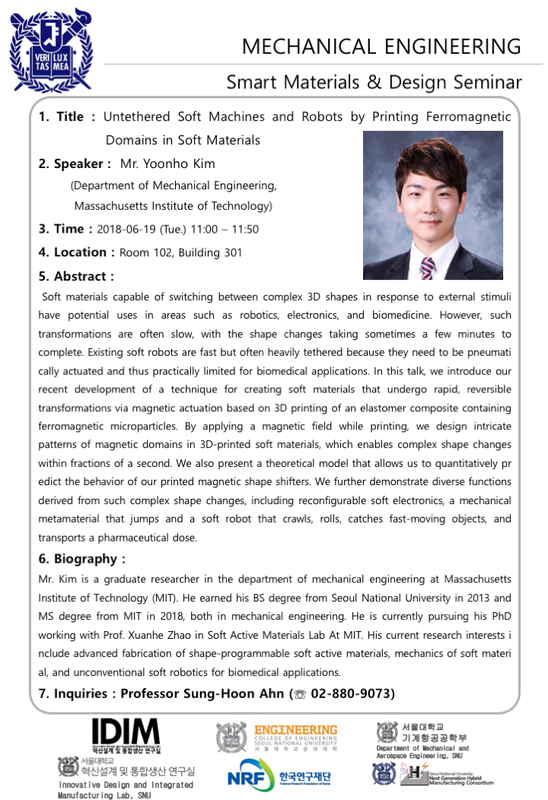 Yoonho Kim, “Untethered Soft Machines and Robots by Printing Ferromagnetic Domains in Soft Materials,” Smart Materials & Design Seminar, Dept. of Mechanical Engineering, Seoul National University, Seoul, Korea, Jun. 2018.